Egypt's army says a Kuwaiti newspaper "misinterpreted" comments by Abdel Fattah al-Sisi that he will run for the presidency. 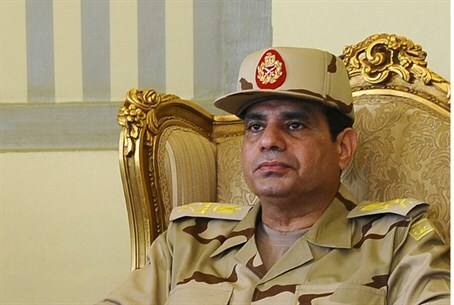 Egypt's army said on Thursday that a Kuwaiti newspaper "misinterpreted" comments by its chief, Abdel Fattah al-Sisi, that he will run for the presidency, AFP reported. The army made clear that Sisi will make an announcement directly to the Egyptian people. Sisi, bolstered by a surge in popularity after he overthrew Islamist president Mohammed Morsi in July, is widely expected to contest and win an election due by mid-April. He has already received backing from the top military council, and his aides privately say he has made up his mind to stand for office. The country came close to receiving confirmation when Kuwait's Al-Seyassah newspaper ran an interview with Sisi on Wednesday, in which he said he would put himself forward. "Yes, the matter has been decided and I have no choice but to respond to the call of the Egyptian people," the paper quoted him as saying. "The call (of the people) has been heard everywhere and I will not reject it. I will seek a renewal of confidence of the people through free voting." The military later said the newspaper had "misinterpreted" his remarks, without elaborating, adding that Sisi would formally make such an announcement directly to the people. "What was published... is nothing but journalistic interpretations that are not direct declarations from Field Marshal Sisi," army spokesman Colonel Ahmed Ali said in a statement quoted by AFP. Sisi would need to resign as army chief, defense minister and deputy prime minister before nominating himself. Government officials say a cabinet reshuffle will take place soon, possibly next week. Since Morsi's ouster, Sisi has emerged as a nationalist icon often compared to Gamal Abdel Nasser, the colonel who ruled Egypt between 1954 and 1970. His portrait is ubiquitous in Cairo and his supporters view him as a tough leader who can restore stability after the chronic unrest that has plagued Egypt since the 2011 popular uprising that toppled Hosni Mubarak, another former military officer. Mubarak had appointed Sisi as his military intelligence chief, making him the youngest officer to hold the post. Morsi, who succeeded Mubarak, promoted him to defense minister after purging commanders whose loyalty he doubted.